We have surveyed the Angeles Crest Highway (SR2), the Angeles Forest Highway (AFH), and a handful of other roads in the eastern San Gabriel Mountains, in order to determine the distribution and properties of the four subspecies of Chrysothamnus nauseosus present here. Surprisingly, we find that two subspecies, consimilis and mohavensis, are not present in their pure forms. Instead, they form an intergrading complex whose properties are nearly homogenous throughout the area except for a general trend for longer involucres from southeast to northwest. We find a strong dependence of bloom time on elevation. On the desert side of the mountains, all subspecies begin their bloom first at the highest elevation, with bloom progressively delayed with lower elevation. On the coastal side of the mountains, the consimilis / mohavensis complex also begins blooming at the lowest elevation, with its latest bloom at intermediate elevations. At any given elevation, each subspecies has a distinctive bloom period. The other botanical properties of the four subspecies are largely as expected from the floras, although the corolla lengths are somewhat different than that given in the floras. The plants are beautiful; the roads along the desert slopes are lined with their showy yellow blooms in September and October, providing the best flower display of the fall season. The plants are easy to recognize, at least to the species level, being prominent shrubs, with their discoid heads with exactly five flowers per head and their phyllaries in exactly five vertical ranks. Finally, the plants are simply amazing, that they can bloom so well a full six months after significant rainfall in areas that receive little rainfall in the first place. How they manage to do that is no small feat, one that we constantly admire. 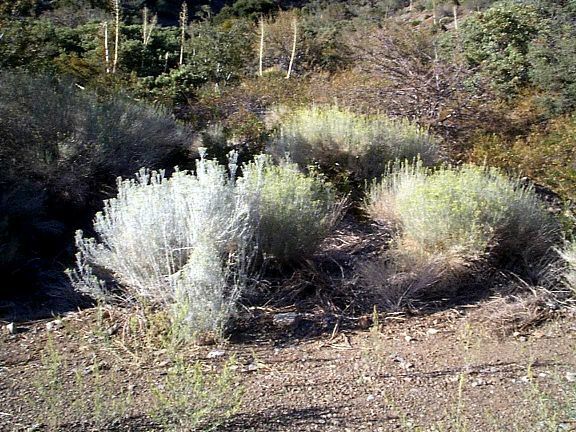 In 2001, as Tom and Jane were embarking on our quest to learn the plants of Southern California, we decided to study all the rabbitbrush plants along the Angeles Crest Highway (SR2) at its northeastern end, to see if we could find and recognize the different subspecies present in Southern California. We are quite interested in plant distributions, and so also decided to produce a map showing the range of the different subspecies. Although we produced a map in 2001, our understanding of some of the subspecies was incorrect, which we came to gradually realize over the next few years. Finally, in 2004, thanks to vouchers from the Rancho Santa Ana Botanic Garden Herbarium, which clearly indicated we were wrong about one of the subspecies, we returned to the subject. Tom and Jane collaborated with Michael, and we three did a much more complete and thorough survey. For those interested in how many ways one can go wrong in identifying the C. nauseosus subspecies in the San Gabriel Mountains, and the evolution of our understanding toward final enlightenment, see How We Finally Correctly Identified The Rabbitbrush Subspecies in the San Gabriel Mountains. In the rest of this paper, we will refer to rubber rabbitbrush simply as rabbitbrush, since we discuss no other species of Chrysothamnus. Angeles Forest Highway (AFH) all? The sampling interval was ~1 mile in 2001, and varied from ~1-4 miles in 2004. Mileages are referenced to locations in our Angeles Crest Highway (SR2) Road Guide. All physical characteristics of each specimen were measured in the field in 2001. In 2004, the leaf, involucre and corolla properties were generally measured using a dissecting microscope; all other characteristics were measured in the field. Vouchers were obtained on 27 August 2004, 3 and 9 September 2004 which will be deposited at the Rancho Santa Ana Botanic Garden Herbarium. We discuss first how to identify C. nauseosus and its subspecies in the San Gabriel Mountains, and then discuss each subspecies in detail. C. nauseosus is one of seven species of shrubs that produce copious yellow blooms along the roadsides of the San Gabriel Mountains in September and October of each year. Although to a beginner these species look fairly similar from a car traveling at 50 mph, it is very easy to distinguish these species up close. After becoming familiar with these species, it soon becomes easy to recognize the other species from the car as well. Only three of these species are common, including C. nauseosus. See Key To Fall Yellow-Flowering Shrubs In The San Gabriel Mountains for a key, with and without pictures, to identify C. Nauseosus. There are only two common species that might be mistaken for rabbitbrush. Scalebroom, Lepidospartum squamatum, is the most common look-alike plant. Its inflorescence looks very similar to rabbitbrush, and it occurs in large numbers with a habit very similar to rabbitbrush. It is easily distinguished from rabbitbrush by its bright green glabrous stems and scale-like 2-3 mm leaves. Creek Senecio, Senecio flaccidus var. douglasii, is only somewhat similar in appearance at first from 55 mph. It is a more open shrub, typically occurs in much smaller numbers, and has obvious ligules and a distinctive coloration. The third most frequent look-alike species is Parish's goldenbush, Ericameria parishii, which typically occurs singly, and is a much more leafy plant with much wider leaves. The hairiness characteristic of rabbitbrush stems need discussion. The floras key C. Nauseosus under stems tomentose or felted (JM) or twigs densely pannose-tomentose (Munz). This caused us immense confusion, since to the eye, most stems of C. Nauseosus are glabrous, with no visible hairs at all! Close inspection finally revealed that the stems are actually covered with a tight layer of hairs embedded in a gluey matrix. Under the microscope, if you scrape at the stem, the covering will break, and at 30x, the ends of hairs will become visible. There are only three subspecies and subspecies complexes in the San Gabriel Mountains, although two of the taxa appear in a bewildering array of forms. Although the following key will easily and quickly discriminate the three taxa, you will be stunned at the differences in plants within each taxon. You will probably find it hard to believe that different plants that key out to a given taxon are in fact the same taxon! The word ssp. will be dropped in the rest of the paper for brevity. In the above tables, properties we have observed are indicated by an X (commonly observed); I (infrequently observed); or a numeric measurement. Additional properties stated in Munz or the JM are indicated by a ?, since the plants in the San Gabriel Mountains may not have those properties. An example is a tomentose involucre for bernardinus. We have never observed this, but Munz states that the outer phyllaries are often puberulent or rarely tomentose. The color White-Green / Yellow-Green is interesting. The floras almost uniformly describe this as Yellow-Green, and we can sometimes see a yellowish caste to the green of the stems. However, more often, we see the stems as White-Green, looking like a green stem with a thin somewhat-transparent coat of whitewash on it. Hence we have made that a single category in the above table. Munz gives no elevation range for ssp. consimilis; the Jepson Manual (henceforth, JM) gives 1000 - 2900 m (3300 - 9500 feet) as its elevation range in all of California. A fifth subspecies, leiospermus, is found in the mountains of the east Mojave Desert, and so is not found in the San Gabriel Mountains or nearby. As described below, we find that consimilis and mohavensis are not distinct in the San Gabriel Mountains, and hence treat this as a single complex. This section contains a discussion of how to separate the species, and gives a key to do so. Many of the properties are explored in detail. In fact, it is quite easy to distinguish consimilis from bernardinus by the appearance, especially using the width of the leaves, the overall leafiness of the stem, and the stem color. However, as is often the case, you have to know what to look for, and you have to have seen both taxa. These characteristics can be seen in pictures of both species, and are discussed below. It turns out that many plants of both species have an involucre that is ~10 mm long, which makes that part of the key useless for those plants. Every leaf from the many specimens of both taxa that we have seen in Southern California has always been 1-veined; we have never seen a leaf from any true bernardinus with more than 1-vein. So that characteristic is useless. Leaves from consimilis are typically ~1 mm wide in the upper stem, but we have seen many plants whose largest leaf anywhere on the plant is ~2 mm wide. So until we had seen and recognized a true bernardinus, we couldn't use this key to produce a consimilis id, since we had some leaves wider than 1 mm. However, once we saw that the typical leaf on bernardinus plants has a width of ~2 mm, and that the typical leaf on consimilis has a width of ~1 mm, suddenly the leaf portion of the key is obvious, and very reliable. This once again proves the maxim that in order to understand a key, one often has to see both species. As mentioned above, we found it easy to immediately identify hololeucus and mohavensis, but did not distinguish bernardinus from consimilis in our 2001 work. Thus in some of the plots below, the latter two species will be combined. The white form of hololeucus is by far the most easily recognizable, even from a significant distance: it looks like a white ghost and stands out dramatically from its surroundings, due to its white stems and white leaves. However, hololeucus comes in a greenish form as well, which is also visible in the linked picture, which must be examined up close to identify it. Our hardest challenge was separating consimilis from mohavensis. We could find no reliable way to distinguish these two species in the San Gabriel Mountains, using any of the properties that are said to distinguish them in the floras. It finally became apparent to us that these two taxa form an intergrading population in the San Gabriel Mountains, as shown clearly by the following plots. The floras separate these two taxa by the length of the involucre, the length of the leaves, and by whether the stem is leafless or leafy at flowering time. (add table with values from floras). We find no correlation at all of any of these parameters with each other. We will analyze the correlation of these characteristics in the new set of plots. (add boxes from floras). As can be seen, there is no correlation at all. This frustrated us immensely, since the floras indicate that consimilis has leaves 10-50 mm long, and mohavensis has leaves 10-30 mm long. The peaks at integer lengths are due to some measurements that were made only to the nearest mm. If one smooths the curves by distributing some of the integer measurements into neighboring bins, this histogram is not very different from a smooth Gaussian-like distribution. That is, there is no evidence for the existence of two separate taxa in this population. We initially tried to classify all plants as either mohavensis or consimilis by imposing a break point near 8.25 mm in the median involucre length for each plant or set of plants at each location. However, there were a significant number of plants that were at the break point, implying this division was artificial, and we could not find any other characteristic that supported this division. A break point at any other value worked no better. Nonetheless, we continued to cling to the belief in two separate taxa until we made the following plots. Even with this breakdown with geography, there is no clear break point in the involucre lengths near 9 mm. Seeing this trend with geography immediately dispelled our belief in two separate taxa, since the smooth variation with geography clearly implies the two taxa intergrade in this area. The JM mentions that these two species sometimes integrade; there is no better evidence for an intergrade than the above plots. In the plot above, the specimens are divided by the median length of their involucre, referred to simply as length in the legend above for brevity. That is, we made many measurements of the involucre lengths for each plant or group of plants, and used the median value of those measurements. The median values less than or equal to 8.5 mm are plotted as blue diamonds; median values greater than 8.5 mm but less than or equal to 9.5 mm are plotted as green rectangles, etc. if you went over to Mt. Gleason Rd (or perhaps the Liebres) and took some samples, and then went over to Mt. Baldy Rd and took some samples, you'd be justified in thinking you had things that were different enough to be separate subspecies, but with the great intermediate mass in between, those locations just appear to be the opposite ends of a spectrum. The other two subspecies are also easily separated by their leaves. The leaves of consimilis are mostly threadlike (with their width ~equal to their thickness), with typical widths of ~1 mm, and are not an obvious feature of the plant. In contrast, bernardinus appears leafy, with leaves distinctly wider than thick, and typical widths of ~2 mm. See pictures of the plants and a flower stem of consimilis next to one of bernardinus. In addition, plants of consimilis are significantly taller than plants of bernardinus. These plants are often found side by side, and this property makes it easy to distinguish them from a distance. However, because the plants vary in size with age, it is not possible to place a numeric value on this, except for the oldest, tallest plants. As discussed in the introduction, the stems of consimilis do not appear to have any hairs on them at all to the eye. But there is actually an outer layer on the stem that contains whitish hairs in some sort of matrix. If you scrape off the outer layer under a microscope, you can see the ends of the hairs protruding from the cut sections. The color of the stems depends on the eyes of the person viewing the stem, and probably the lighting conditions. The color of the stems of consimilis is said to be yellowish-green in the floras. Jane at times can detect a yellowish cast to the stems. Tom always sees the stems as white-green, as if a green stem had been white-washed with a thin coating of milk. Each of us sees the stems of bernardinus as white. Note that there is supposed to be a green-stemmed version of bernardinus, but we have not seen any so far. The subspecies can usually also be easily distinguished in the field by their bloom stages (see next section). Each of the subspecies have different elevation-dependent bloom periods. The following three plots show the bloom stage of each species on the three times we surveyed large numbers of plants of each species. These data are all from the desert side of the mountains. There is a clear trend for each species to begin blooming at the highest elevations, and for the bloom to be progressively delayed with decreasing elevation. Hence on 21 September 2001, essentially only bernardinus and consimilis were in bloom, and they were in full bloom or past full bloom. Only a single plant of hololeucus was in full bloom; all other plants of both hololeucus and mohavensis were only in bud or had just a few flowers. By 11 October 2001, every plant of consimilis and bernardinus was past full bloom, with half of the plants nearly completely finished blooming. In contrast, all plants of mohavensis and hololeucus were now in full bloom at most elevations, with only the highest elevation plants past full bloom. Also mention lepidospartum spp and senecio douglasii. The species separate well in SnBr. The length of the corolla lobes gives away hololeucus, and the length of the involucre gives away mohavensis. The leafiness of mohavensis does tend to be less than that of consimilis, but both depend on altitude and bloom stage. Similarly, the maximum leaf length does tend to be longer for consimilis than for mohavensis. However, the position of the corolla lobes is problematic in samples taken home. The position may need to be noted in the field, or it may just simply not be as good a discriminant here. The length of the corolla lobes needs to be looked into as a possible consimilis / mohavensis separator. Munz says only consimilis has lobes in the 1.0-1.5 mm range. Thus it is possible that the first mohavensis on the coastal side is actually an intergrade, but this is probably a little-studied characteristic, so using this as evidence for an intergrade is weak. Just as in the San Gabriel Mountains, the white/green stem form of hololeucus appears to have significantly longer involucres than the white stem form of hololeucus. The most common higher elevation subspecies in the San Bernardino Mountains is consimilis, just like in the San Gabriel Mountains. There is little intergrade of consimilis with mohavensis in the SnBr, perhaps due to the higher elevations. The involucres are all solidly in the consimilis range for every consimilis. The higher elevations of the San Gabriel Mountains show little evidence for intergrades there, too. On the coastal side, again both mohavensis and hololeucus are found together, and only at the lowest elevations. The distribution of these two subspecies could be continuous through Cajon Pass, or continuous through Beaumont Pass, or both. In fact, McMinn gives a location for the white/green stem form of hololeucus (the former ssp. gnaphalodes) as "on the mesas near Colton". This is less than 15 miles away, in virtually the same habitat and elevation.